Magictail is Germany's most popular tailmaker. Their costumes are made of lycra, but are unique it the fact that they have a realistic looking scale pattern printed onto the fabric. Unlike more fabric tailmakers, who use Finis brand monofins, Magictail use custom monofins made of polycarbonate. -Use: I use my tail just for fun. I swim mostly in pools but with an occasional lake or ocean. -The Skin: The tail has a base color of yellow with green on top. It has a realistic scale pattern. On the fluke there are "veins" that look almost like piano keys. The skin is a little bit big for me and will wrinkle, but I got it this way on purpose so I won't outgrow it. The monofin is shaped on the bottom like a "V" and on the top like a sideways "C" if that makes sense. It comes with a white protective cover. The heels are a bit big and bulky. After a while the screws holding the fin together rusted, it has not affected the monofin besides leaving stains on the cover, but it may in the future. Compared to my MerFin it does not give very good propulsion. You go faster than someone just swimming, but no where near the speed of someone with a more professional fin. -Ordering: It takes a week for the tail to be made and then begin the shipping process. To get to the U.S from Germany takes a while, so shipping is a bit longer than I would of liked, but you get a working tracking number. However my tail came a whole week before the expected arrival. This was a very happy surprise. -Communication: I emailed back and forth a few times with Kirsten, the owner. English is not her first language and so there was an occasional typo, but it was still easily understandable. She was always polite and quick to respond. My first skin came with a tear and she sent me a new one at no cost. I ordered from her before you could buy monofins and skins separately, so I doubt she would give you a new one now. -Suggestions: Be careful in rough, shallow pools as it is easy to damage the tail. With time the foot pockets in the monofin will stretch. This actually helped me because my feet have grown since purchase. All in all I am happy with my tail. I have had it for over two years and it is still in reasonably good shape. I would recommend this to anyone looking for a recreational tail. I bought my Magictail at Christmas and thought it was the price was reasonable. The scale pattern is beautiful and it looks stunning underwater. I sewed some sequins at the end semi-circle of the the scales and in the sun they look very pretty. I swam in the tail last week and it is very easy to swim in and the movement of the monofin looks very realistic. The problems I found were that after my first swim the material on my heels had worn and created holes which I had to sew up. As stated in the previous review the heels are very visible and material does fill up with a lot of air which can cause the effect of very embarrassing (Bubbles) when you enter the water. Overall I would say this is a very good practice tail because the children I was swimming with seemed to love it, it is very light and a lot of fun to swim in, however if you are planning on becoming a professional mermaid I would definitely spend a bit more money on a latex or silicone tail. I gave magictails a 4 out of 5 stars because when I received my tail, i was overjoyed, and immediately went to the pool. Maybe I was not as careful as I should have been, but when i came out of the pool, there were two small holes in the heel of the tail. i decided it was my fault, and I should have been more careful, and so I was going to tell my friends that had ordered the same tail to be careful with theirs. But then my friend told me that after HER first time swimming she had some holes in hers, too. But the holes can easily be sewn up and are not THAT big of a deal. The tail looks great in the water, though. I love the way the fin flops when you shake it, or when you swim, the monofin bends in a very pretty way and looks very realistic. But I don't recommend this tail if you're looking into more professional mermaiding. I suggest you invest in a more realistic tail, because the heels on this tail stick out more than I would like, and it IS a cloth tail, so the knees do tend to show. I do really like the scale pattern printed on the tail, and it fits well. My tail was well worth my money, and the woman is very nice. I emailed her with a few questions, and she responded as soon as she could, and was very helpful. If you're looking for a nice, cheap, semi-realistic tail, I DEFINITELY recommend magictails. Just beware that the fabric is very delicate, so if the bottom of your pool is rough, be extra careful! I bought this tail to use as a toy, that is, just for swimming and have fun with it; maybe some personal pics, but nothing professional. 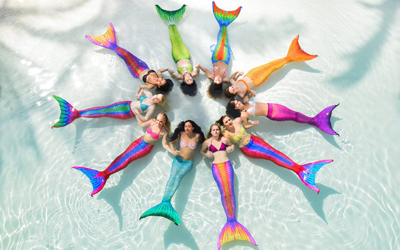 I think the seller intended this tail to use for make-believe, playing and swimming, not for professional mermaids as a work tool. I did not have any problems while on the website. “English” can be selected as language so one does not need to struggle with German. There is available a size chart to check on the measurements for the tail, the monofin and the bra size, both in inches and European sizes, and the FAQ answered all the questions I had. There is an Exchange rate converter in the website, so you can know how much the costs are in your currency. Payment options include PayPal and credit cards. The site requires to make an account to buy, but it also has a small community of users, and you are able to upload pictures and make contacts. It took a week for them to ship my tail, and I received an e-mail once it was out, with a tracking number to follow it. Once shipped, it took one week to receive the package at my place; I live in Europe. The tail arrived packaged in a strong cardboard box, inside a plastic bag, with an instruction sheet on how to use it and how to take care of it. It also came with a matching bra and bikini bottom, made from the same fabric as the tail, and a white protective shell to cover the monofin. The tail is made from swimsuit-like fabric, printed with a scale pattern. It has a distinctive front and back. It is very soft, and stretches slightly. The monofin has a dolphin-like fluke shape. It’s transparent and very floppy, and it can be taken out. The white protective shell is made of polyester. It looks like fleece to the touch. Its use is required to not damage the skin of the tail while in use. Pros: easy to put on and take off; easy to wash and fast to dry; easy to transport (it is very light and not very big); it does not move at all while in use; the monofin does not have straps and it does not lose grip while swimming. Cons: it is made of fabric, so it can easy rip or get damaged by ocean floor or rocks while swimming; it gets sand inside, specially at the tips of the fluke – to take the sand out you have to turn the fabrics inside out; heels are visible. For somebody that does not have professional gigs in mind, I think it is very worth the money. I do not have big plans for this tail, so I think it serves its purpose quite well. - The inside material of the monofin has rubbed off where my heels are while swimming. Now there are two small holes on it. Some of the screws of the monofin got a bit loose, but was able to fix them with a regular screwdriver. No problems with the monofin while swimming. - The monofin protective shell is in perfect conditions: no holes, no need to re-stitch anything. - The bikini and the tail skin also are in good conditions. They were hand-washed everytime the tail was used, and put to dry in a shade. There is no decoloration, no running of the colors (even after swimming in pools most of the time), and no need to re-stitch anything. There are no damages on the fabric (holes or friction) except where I rubbed it against pool walls or bottoms, and that was totally my fault. I would still recommend this tail to any non-professional mer. Last edited by Talia; 08-25-2013 at 06:41 AM. I chose the Magictail for a first mermaid tail because it was cheap, yet looked good, and because I thought I'd be able to use the monofin in a different tail later. The tail is very easy to put on, both on the beach and in the water. The scale print on the spandex/lycra is really lovely, and looks good in and out of the water. It should be noted that while I bought the "Ariel" green tail, it looks very blue in the ocean. I don't really have a problem with it, but if you're looking for a truly green tail, this might not work for you. So far I've put my tail through one normal machine wash cycle, and have found no problems with it. I've worn my tail twice now in the ocean, at beaches with varying sand granules (first beach was smooth, second was rough and rocky) and have not had problems with holes of any kind. This is despite some rather rough play. I had to roll myself to the water at my first beach, and then dragged myself along the sandy bottom in the surf to get out of the water. The opening at the bottom of the tail-where the monofin is removed- sometimes flaps around while swimming, but this is not very noticeable. The white, fuzzy protective shell that you are supposed to wear over the monofin and under the fabric tail came off all by itself while swimming, bunching up under the lycra and making it look funny. It was a little hard to fix while wearing the tail. The monofin gives great propulsion while swimming. I felt comfortable and confident in it. When swimming, if there is a light source behind you (or above you, like the sun) the gap between calves can be seen. The reason I gave this tail a 4 out of 5 and not a straight up 5 is because the heel sticks out so far. I bought the tail because, despite the beauty of latex/silicone/neoprene tails, they were too expensive, but I still wanted to take nice pictures and video in my tail. The heel is detrimental to this. Not only does it stick out far, but it's boxy looking. For this reason, my idea to buy the Magictail and then use the monofin in another tail is no longer feasible. I got my magictail for my birthday. I didn't pay for it. I got the H2O in size large. It's a great tail, really pretty. The monofin does not propel you like a finis, but I wouldn't expect it to because of how floppy it is. I'm giving it a 3 out of 5 because we got charged over sixty dollars in customs (which we weren't warned of) and because my monofin broke after a month of use. I was extremely careful with it, I didn't even swim as hard as I am able to. I've never hit it on the side of the pool. If you get this tail I recommend you to only swim very lightly. This used to be my favourite beginner tail. Major disappointment for anyone who has swum with a real monofin before. The propulsion is petty. It is very floppy and breaks easily, even if you're treating it like a raw egg and never scrape/bump it. On top of that, it is highly uncomfortable. I always get bruises and cuts when using it. the newer monofins are thicker and stronger and give a bit more propulsion, but they are just as uncomfortable. Guess I'm too tall and heavy for this kind of fin. Kids are probably ok with it. Last edited by Echidna; 02-19-2016 at 10:06 PM. i received my second and third tail from magictail. The box is VERY hard to open. The fabric is very thin and rips REALLY easy. I LOVE the scales on it but i wish the fabric was a little thicker. i am NOT a fan of the opening underneath but i could deal. This was my first tail. By far it was a great starter tail however the only complaint I would have is the ankle rubbing from the footpocket. Swimming in it was easy, and it'd easy to put it on and take off. I ordered this tail for my second tail, before I had a very simple tail (that's for another review). I love this! After I swam a couple times there was some wear on the fin but it's not too noticeable and I don't really mind. I got the medium in the H2o color and it is GORGEOUS. It takes a bit of getting used to when you swim, but maybe that was just for me because my first tail had a much smaller fin. I would probably not recommend this to someone who did lots of mermaid performing. The scales look real and the tail design looks great. However it is not designed in such a way that the fluke/monofin lies flat on the ground, and therefore looks more like a costume and less like a 'real' tail. But whatever, this doesn't bother me at ALL because I just use it for recreational purposes. Also, the fabric is soft and the tail is very light compared to professional ones, it's only about two pounds. All in all, I ADORE my tail. And it was such an easy ordering process. The fabric at the tip of the fluke is open so that you can easily take the monofin in and out. I don't really mind how it looks, but when you swim it floats on the top of the water a bit, I guess it fills with air? It's okay for me though. All in all, I love my tail so much! I'm extremely glad I ordered it! Just a side note: When I swam in a public pool all the little kids surrounded me and they LOVED it, it was hilarious and so cute. This tail is a real attention grabber! Last edited by mermaidm; 10-12-2013 at 10:35 AM. Reason: More info! fin: not so good. broke in my first month of wearing it. i emailed her and she speedily replied despite the time difference! she sent me over a new fin soon and gave me a discount on shipping! Sadly that fin broke too. :(. my dad, being awesome made me a custom fluke with stronger plastic and used her feet things in it and it fit well! Customer Service review: AMAZING! she always emailed me about everything and was really nice and custom shipped me a new skin before she added that to her website! shipping and handling review: shipped and delivered on time! even gave me frees shippping for a new fluke!!!! I bought this a couple of months ago as I wanted something realistic, inexpensive and not too brightly colored. Got the 238 Tail Skin Female size L and 371 Bikini Top size XL. The material is beautiful! Its so soft and shiny when dry. Waited a long time to wear my tail because I've had to make alterations to it. I'm 5.9 in height and found the tail is just a tad short. Ankle of tail is 8 cm above my ankles. So may be a bit short in length for taller people. Just came back from the pool and it is super! I did keep an eye on it for about 10 mins as I was worried that the colors would run, but it didn't. The colors seem brighter underwater, it kinda had a glow to it. And you can still see the shimmer on it as if it was still dry. Its a very beautiful fabric to wear, its lightweight and super nice! Pros: Affordable, most realistic looking of all the fabric tail makers out there, good fit on the legs and waist. Cons: Tail too short for tall people, bikini bra isn't lined or have any support, bikini bottom sizing seems a bit off but its ok once you wear it a few times. Here is a photo. You can see its quite short in comparison to my homemade tail. Tail skins and monofins are interchangeable between Magictail and Fin Fun. Last edited by Mermaid Jaffa; 02-05-2016 at 09:12 PM. -Use: I have used my tail over the last three years, swimming in rivers and the sea, I have also lent it to photographers and models for photoshoots and videos, as well as used the tail on dry land as a costume. The colours of my tail were vibrant and beautiful, and in water the colours reminded me very much of the h2o tails. The skin is stretchy and fits like a glove, and is very soft and comfortable to wear. This is one of the best shaped monofins I have seen as in to use in mermaid tails. It is smooth and nicely shaped to make it look realistic within the tail. The actual monofin is VERY easy to scratch and mark...and even though I am a very careful person, I still have a variety of scratches all over it. It gives a good amount of propulsion, especially considering I was able to swim against a current in the river which is usually a horror to swim against with legs. -Communication: I e-mailed the seller and creator of the tails before ordering, asking if the tails were suitable for ocean use and using in a saltwater river. She answered back quickly, and although the English wasn't the best the general message was easy to read and understand. - Has lasted me so long with barely any trouble at all! Bought the Arielle mermaid tail in a size medium to use with my FinFun monofin pro. I made a video reviewing the cosmetics, comfort, durability, costumer service and performance of the tail. TL;DW Its a pretty good mermaid tail although it is see through due to the thinness of the fabric, I think it looks a lot nicer than my finfun tail.